A man drank a pale ale while visiting Trillium Brewing Company’s popular beer garden in June 2017. 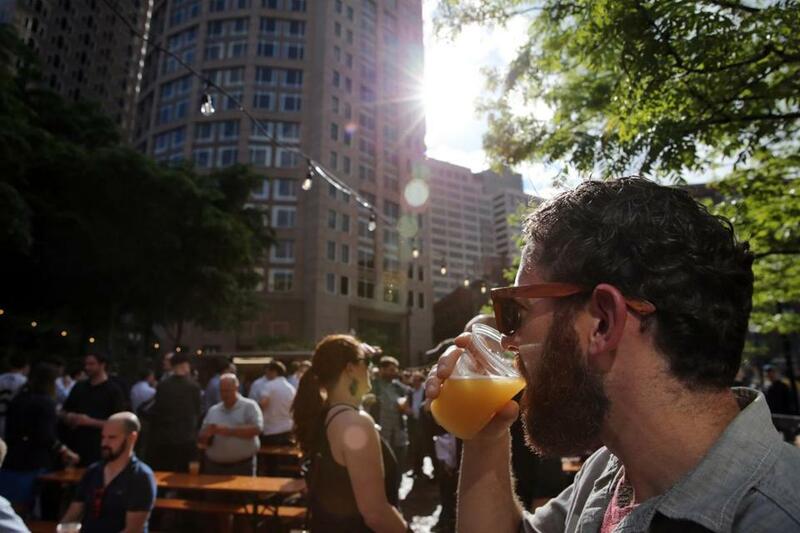 It’s official: Trillium Brewing Company’s popular beer garden is coming back to the Rose Kennedy Greenway this summer. The brewery’s open-concept watering hole will be located at the same spot — on High Street across from Rowes Wharf — and is slated to open in late May and run through the end of October, weather permitting. It will again feature a rotating tap of beers, as well as wine from Westport Rivers Vineyards. The hours for the beer garden this year will be 2 p.m. to 10 p.m. Wednesdays, Thursdays, and Fridays; 11 a.m. through 10 p.m. on Saturdays; and 11 a.m. through 6 p.m. on Sundays, according to the brewery. Just like last year, visitors can bring in their own food, and dogs are also welcome in — as long as they are on a leash. There will also be food trucks nearby on certain days. And once again, there will be a row of porta-potties on the premises. 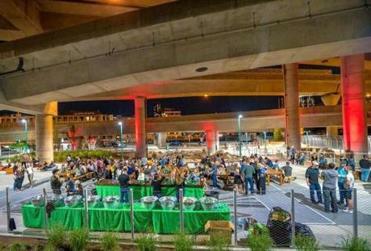 No longer content to punt on creative outdoor drinking spaces, Boston will soon be the kind of city where you can sip a beer and play lawn games under a highway overpass. The beer garden is a result of a partnership with the Rose Kennedy Greenway Conservancy, a nonprofit that runs the downtown park. “Last year, the Trillium Garden on The Greenway was an unqualified success as Boston’s first open-air beer garden in a public park, and we are thrilled to again partner with such a great local brewery,” said Jesse Brackenbury, the conservancy’s executive director, in the statement sent by Trillium. The nonprofit’s officials previously estimated 100,000 people visited the brewery’s beer garden last year. Meanwhile, Trillium co-owner Esther Tetreault said she was “psyched” for the beer garden’s second year. More details about the opening date and operating hours of the beer garden will be available in the next few weeks. The news comes days after the conservancy announced that East Boston’s Downeast Cider will run an outdoor pop-up bar on Dewey Square Plaza across from South Station, about four blocks away from the Trillium beer garden. The open-air bar — which will serve a rotating crop of the company’s ciders, as well as beer and wine — is scheduled to open in late May, and follows Trillium’s success last year. The 4,000-square-foot bar run by Downeast will be open Monday, Wednesday, and Friday evenings, as well as Saturdays and Sundays, through October. Meanwhile, Wachusett Brewing Company will also be setting up an Airstream trailer on City Hall Plaza this summer, serving brewery classics like Green Monsta IPA and Blueberry Ale, as well as beer from guest breweries during special tap takeovers. The “Brew Yard” is part of a city initiative where the plaza will be dressed up with nine “patios” made of reclaimed wood and infused with greenery. The patios, which debut May 4, will also feature five mini-golf holes, as well as ice cream, Boston Public Library book drops, and visits from puppies. The Wachusett Brew Yard will operate every weekday starting at 4 p.m. and weekends starting at 11 a.m.
Globe correspondent Matt Stout and Gary Dzen of the Globe staff contributed to this report.